Customer-driven research is a continuous undertaking at FINCA. We collect data about our clients’ living standards and businesses to understand how they are benefitting from our programs and how we may better serve them. Recently, our Research team, led by Scott Graham and Anahit Tevosyan, conducted household surveys among FINCA clients in Haiti, with support from Global Affairs Canada. Survey data confirm that mission outreach in Haiti is strong: More than two-thirds of FINCA Haiti borrowers are living on less than $2 per day and about one-third live below the national poverty line. Additionally, 86 percent of FINCA’s borrowers in Haiti are women. 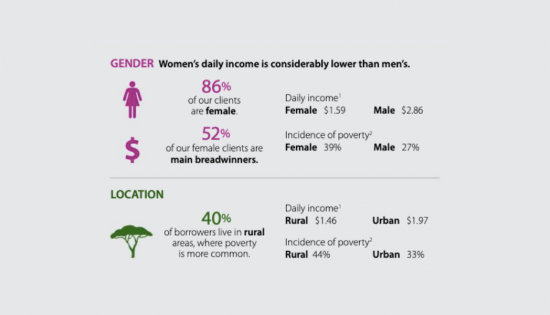 Unsurprisingly, we found that incomes are markedly lower among women and people in rural areas. The data also paints a sobering picture of public services in Haiti. Most clients lack drinkable water in their homes. Sanitation is rudimentary and electricity is scarce. Despite these challenges, FINCA Haiti clients are able to save their resources and secure some basic assets (e.g., motorcycle, TV). This shows that poverty is not a monolithic phenomenon in people’s lives. Even while they contend with low incomes and difficult living conditions, FINCA clients find a way to achieve freedom of movement and information. Review the infographics below for a visual summary of the survey findings.